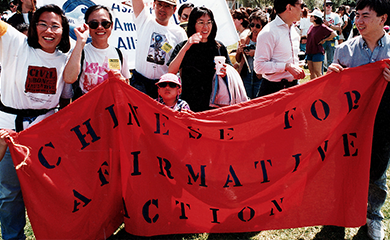 Since its founding, Chinese For Affirmative Action has been on the forefront of ensuring Chinese Americans, other communities of color and disadvantaged people in general have equal access to opportunity. Affirmative action has always been and continues to be a necessary and powerful tool for advancing our equity agenda. Perhaps for this reason, we have witnessed over the decades how white conservative forces often use the Asian American model minority myth to divide our community and to create a wedge between us and others with whom we work by spreading falsehoods about what affirmative action is and how it works. With affirmative action now under attack by the Trump administration, many of the images and stories of Asian Americans in affirmative action debate are advancing false narratives that bely the reality that the majority of Asian Americans support affirmative action and also hide the needs of the most disadvantaged of our community. At the same time, there is tremendous amount of work needed to engage the Chinese American community about how affirmative action addresses discrimination in multiple spheres of life including employment, contracting, media representation. This work has never stopped but we need to do more in certain suburban areas and with more recent immigrants. We know that affirmative action is needed to fight bias and discrimination against Asian Americans, and the problem has never been affirmative action but the status quo that protects white, male privilege. Lastly, it is also critical to acknowledge and reframe the real and pressing problem of higher education scarcity. Though the debate on affirmative action has centered on admissions at selective colleges and universities, the reality is that our community and other communities have made and can continue to make extraordinary gains when we push towards more universal, affordable, and high-quality public college and universities.